Please join us as we launch the 20th Anniversary Edition of Random Kindness and Senseless Acts of Beauty, published by New Village Press. The first edition of this book was published to break the spell of war, random violence and senseless acts of cruelty. Now, as our population has increased and our commonwealth of earth, air, and water are seriously threatened, the call to link arms and lay down armaments is more urgent than ever. With every action, we must reimagine and recreate the world we want to live in, a world of sustainability, justice, and community resilience. May we take to heart the message that every action makes a difference in an inextricably connected world. 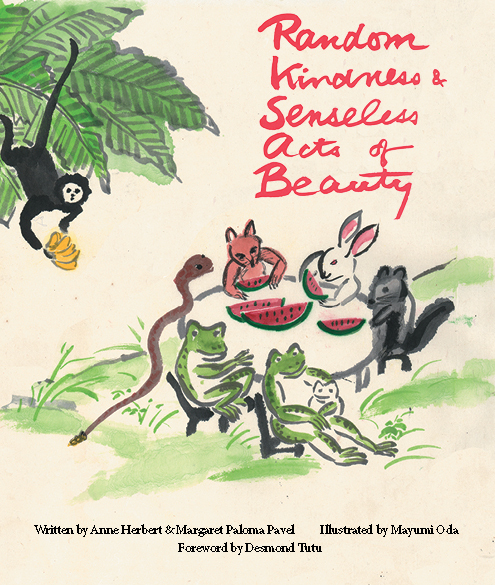 Random Kindness and Senseless Acts of Beauty has become a classic phrase, born of a peacemaking project undertaken by Anne Herbert and M. Paloma Pavel in response to increasing concerns of racial violence and international conflict. Random Kindness was designed to be a spell reversal for breaking the cultural trance of systemic violence, and the phrase struck a chord and went viral, awakening moral imagination and providing a simple language for a profound and evocative call to solidarity and compassion on a distressed planet. In 1994, Herbert and Pavel expanded Random Kindness into a full length prose poem expressing the perennial longing to be our better selves, and to create collective impact toward a better future. The subsequent book featured the words of the poem combined with the celebrated brush painting of Mayumi Oda. Oda illustrated the book using the graphic vocabulary of the Choju giga, a well known Japanese scroll painting dating to the 12th century Heian period. Communicating through these picture stories, people who did not read or write were able to organize themselves in a r/evolution, and take back power in their communities. The book was widely praised, with Buddhist Scholar Dr. Joanna Macy calling Random Kindness a “fold-out, wrap-around sutra” and “all we need to know right now in order to let our lives count in building a sustainable world.” In this anniversary edition, we gather the wisdom and charm of the first edition with renewed focus and vitality. With the proposed anniversary edition we go global, in a full-color 20th anniversary edition with translations in Japanese and other languages, published by New Village Press. We are thrilled and humbled to include a foreword by Archbishop Desmond Tutu in the 20th Anniversary edition of Random Kindness and Senseless Acts of Beauty, dedicated to community resilience and climate justice in the face of global warming. Nobel Laureate and social justice visionary Archbishop Tutu has provided a foreword to our book that connects the message of interdependence in Random Kindness to the South African concept of ubuntu. Ubuntu is the conviction that interconnectedness is the very root of who we are. Desmond Tutu’s wisdom and leadership in the Truth and Reconciliation process in post-Apartheid South Africa have been a deep inspiration to activists and compassionate human beings around the world. His profound insight that forgiveness and ubuntu are key to resilience in the face of adversity is foundational for community resilience work in response to global climate change. We are indebted to Desmond’s brilliance and moved by his life of service, and we are honored to be featuring his words of wisdom, strength, and hope. Brief endorsement written for the back cover of our 20th Anniversary edition. This exquisite book offers guidance to us all. Review published in The Whole Earth Review. Looking for a fold-out, wrap-around sutra? You can read it in one minute (if you don’t pause to relish the exuberant artwork, which is unlikely). You can chant it aloud in three minutes (it’s great, I discovered, for intoning in groups). You can stand it upright around your zafu to make an instant six-inch-high temple courtyard; and you will return to it ever again for sanity and delight. This is the real article, brought to us by streetwise bodhisattva, Anne Herbert, who authored the phrase you see on walls and bumperstickers, and Margaret Pavel, word wizard, systems thinker and global therapist, along with Dharma artist Mayumi Oda, whose wondrous frogs remind us that this time we awaken with all beings. Good things come in small packages. About as long as the Heart Sutra (I counted the words), it distills — in ordinary, inspired language — all we need to know right now in order to let our lives count in building a sustainable world. It tells us about the kind of power we each have right now to take choice — and the delight that can be ours, if we are not afraid to seize it. Endorsement written for the back cover of our 20th Anniversary edition. One random act of kindness can set a thousand others rippling out in ever widening circles. Beauty simply enjoyed far from any thought of usefulness can liberate a purpose-ridden world and set meaning free. Kindness and beauty wield power – power enough to replace the pyramid of violence, competition, and greed, with a network of breakthrough communities that model peace, cooperation, and sharing. It’s all so basic and simple, but we need to be reminded of it again and again and this book is a timely reminder. Review of our 20th Anniversary edition. Wow! This book is amazing. The message is so important and relevant! I believe that we all have the power! I love the way this book sends this message of goodness to children. Children are the future and this book conveys HOPE! It is rich in language, thought provoking and positive.